Here are the steps we took on this floor to make it look great. Polished the floor with industrial diamonds to 3,000 grit. This floor was never “mirror shiny” when it was installed, and the client wanted it shinier than it was originally. No problem! Now to replace a floor like this would have cost the client several thousand dollars, and the grout and stone would still have to be sealed to protect it after it was installed, all at an additional cost beyond the installation of the new stone. Our price to Renew this stone floor was just a small fraction of the cost of replacement, and the stone will perform better than it was when it was brand new because the grout lines and stone are now sealed to resist water and oil-based spills. Additionally, our Grout Color Renew makes the grout lines harder than when it was merely grout, which makes them last even longer. 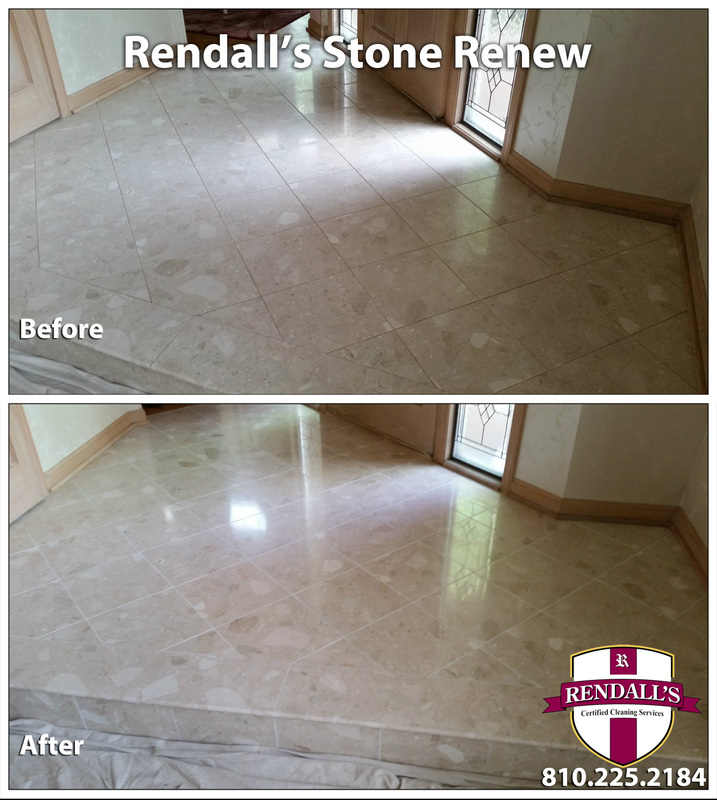 Our client will reap the benefits of our Stone Renew process for many years to come, and best of all she will save lots of time and worry from maintaining her stone floor now after our Stone Floor Renew. Maintaining your stone floor is as easy as sweeping and using a Swiffer once in a while! My wife and I have been wanting to get some stone repair work done for a while now, and I think that we’re finally in a place financially where we can pay someone to do it. Ever since we moved into this home, we’ve noticed a need for some stone cleaning and repair, particularly in our tile, and being able to have some professionals make things look new for us would be great. I’m going to have to see if we can get some stone repair work done, and hopefully make our tile look new again! Thanks for the information!